Bosch Refrigerator displaying an error code? Bosch Refrigerators have built in diagnostic systems. If your Refrigerator finds, sees, or detects a fault or error in the system, it will show an error or fault code. The error code will display where the usual numbers are on the display screen. When an error code is displayed, your Refrigerator is telling you a specific fault. The error code will tell you which parts on your Bosch Refrigerator to replace or check. You can also Search YouTube for Bosch Refrigerator Error Codes or get advice from your Bosch Refrigerator owners manual when your Bosch Refrigerator Is Displaying An Error Code. 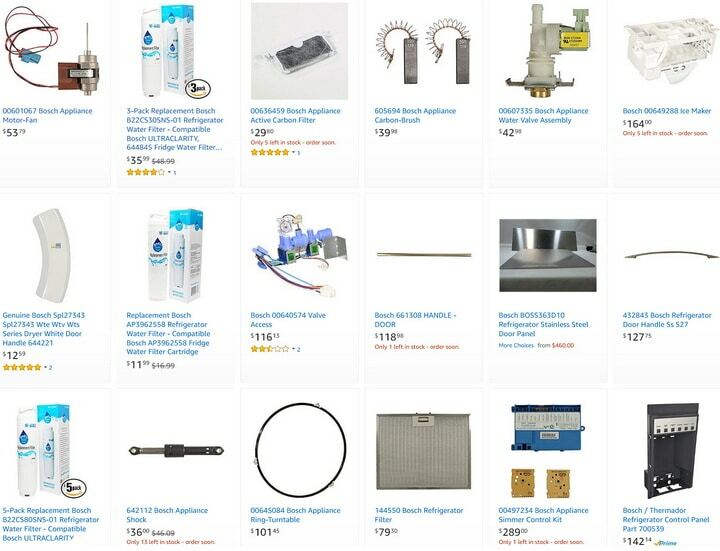 NOTE: Before ordering any parts from the ones listed below, check that the parts will fit with your model number Bosch Refrigerator. ERROR CODE DEFINITION: Refrigerator compartment temperature sensor is faulty. WHAT TO FIX/CHECK/REPLACE: Remove power to the refrigerator and reconnect any loose connections on the wire harness on the temperature sensor for the refrigerator compartment. -This is located in the upper right corner of the refrigerator. -Remove and Replace the wire harness if broken or faulty. -If the wire harness connection checks good, replace the refrigerator compartment temperature sensor. PARTS THAT MAY NEED TO BE REPAIRED OR REPLACED: Refrigerator Compartment Temperature Sensor – Wire Harness. ERROR CODE DEFINITION: Freezer compartment temperature sensor is faulty. WHAT TO FIX/CHECK/REPLACE: Remove power to the refrigerator and reconnect any loose connections on the wire harness on the temperature sensor for the freezer. -Remove and Replace the wire harness if faulty. -If the wire harness connection is okay then replace the freezer compartment temperature sensor. ERROR CODE DEFINITION: Temperature controlled drawer temperature sensor is faulty. WHAT TO FIX/CHECK/REPLACE: Remove power to the refrigerator and remove the temperature controlled refrigerator drawer. -The temperature sensor is located on the right side of the refrigerator compartment liner. 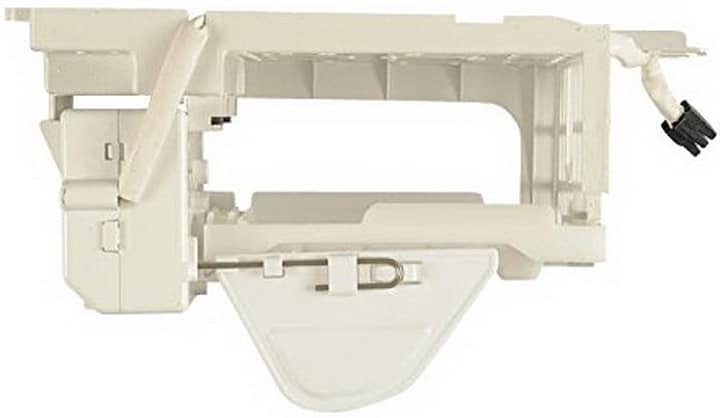 -Remove the sensor cover and reconnect any loose connections on the wire harness on the temperature sensor for the drawer. -Reconnect the main wire harness if not secure. -If the wire harness is okay, replace the temperature controlled drawer temperature sensor. PARTS THAT MAY NEED TO BE REPAIRED OR REPLACED: Temperature Controlled Drawer Temperature Sensor – Wire Harness. ERROR CODE DEFINITION: Main control board module is faulty. WHAT TO FIX/CHECK/REPLACE: Remove power to the refrigerator for 5 minutes to attempt to reset the main control board module. -If the E10 error code returns after you restore electrical power then remove and replace the main control board module. PARTS THAT MAY NEED TO BE REPAIRED OR REPLACED: Main Control Board/Module. ERROR CODE DEFINITION: Display control module is faulty. WHAT TO FIX/CHECK/REPLACE: Remove power to the refrigerator for 5 minutes to attempt to reset the display control module. -If the E11 error code returns after you restore electrical power then remove and replace the display control module. PARTS THAT MAY NEED TO BE REPAIRED OR REPLACED: Display Control Module. 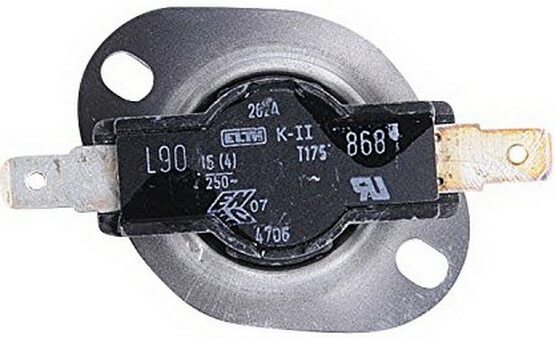 ERROR CODE DEFINITION: Ambient temperature sensor is faulty = The ambient temperature sensor is an internal component of the display control module. -If the E15 code returns you restore power then remove and replace the display control module. ERROR CODE DEFINITION: Communication error between the main control board module – and display control module. WHAT TO FIX/CHECK/REPLACE: Remove power to the refrigerator and reconnect any loose or non-secure connections on the wire harness for the main control board module and the display control module. -Inspect the main control board module and the display control module if faulty. PARTS THAT MAY NEED TO BE REPAIRED OR REPLACED: Main Control Board Module – Display Control Module – Wire Harness. ERROR CODE DEFINITION: Communication error between display control module and ice and water dispenser control module. WHAT TO FIX/CHECK/REPLACE: Remove power to the refrigerator and reconnect any loose connections or non-secure wires on the wire harness attached to the display control module and the ice and water dispenser control module. -Inspect the display control module and ice and water dispenser control module for burned spots on the circuit boards and any other visible faults. -Remove and Replace the display control module or ice and water dispenser control module if faulty. PARTS THAT MAY NEED TO BE REPAIRED OR REPLACED: Display Control Module – Ice And Water Dispenser Control Module – Wire Harness. Need help with your Bosch Refrigerator? Please leave your comment below and we will assist you. Previous post: Window Air Conditioner VS Central Air Conditioner – Which One Is Cheaper To Run?